Pittsburgh's Pothole Problem | Who is Responsible? Who's Responsible for These Destructive Road Hazards? Pittsburgh's age, climate, topography, and budget create a "perfect storm" for one of the most overlooked yet destructive hazards on the roads: potholes. They cause accidents, damage to cars, and are a safety risk to both pedestrians and bicyclists. If an accident stemming from a pothole causes damage and loss in a driver's life, who is responsible? A portion of the state and local taxes citizens pay ensures roadways are maintained and safe, however potholes in Pittsburgh and throughout the state and are still everywhere. 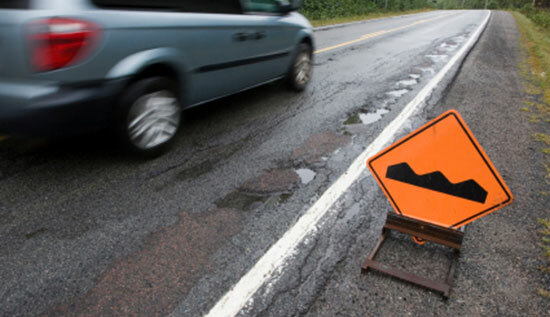 If you are injured in a car accident caused by a pothole, or your car is damaged because of one, beware—Pennsylvania has very specific laws about your rights as a victim of an accident caused by bad roads. You can't sue the state for property damage. You can receive money for your injuries if you can prove that PennDot had notice of the pothole or other bad road condition and a reasonable time to fix it. You can sue for property damage to your vehicle, but you usually collect little more than your insurance deductible. You can sue local governments for serious injuries caused by potholes. You must prove that the local government knew, or should have known, about the pothole and had time to fix it. Note—Time limits apply: you must file a claim in writing against the state or a local government in PA within six months of the date of the crash. Source: “Target 11 investigates drivers filing pothole claims.” Wpxi.com. December 17, 2013.